Sublime Shadows Of Life is a book, which comments on life, its turbulent curves and relationships. It envisions people through the prism of poetry. I, you, he, we and they are universal symbols, which highlight the fact that happiness is not a destination but a chasm to bury agony, anguish, grief, distress and move on! No sea of solitude is so deep that it can drown us. Sometimes aspirations are trampled upon, the boulders of exploitation and discrimination may block your path but those who tread on undeterred are always successful. Now this book is available in print too! We look around and feel – ‘Nothing is perfect’… dreams get shattered, hopes are belied, aspirations delude and the opportunities elude us. The clouds have the power to conceal the sunshine and our radiance fails to ignite positive thoughts. Enhancement of personality is a long process, which starts only when we acknowledge the need for it. Often we detest looking at our imperfections and if somebody is professionally successful, the thought doesn’t even strike. This book enlightens you about the goodness, which lies dormant within us till we make an effort to explore it. It exhorts you to introspect and accept natural human failings. It guides you towards the metamorphosis that could make you an endearing personality. From darkness into light, from despair onto the wider ways of hope…life oscillates between sunshine and shadows. Emerging from shadows is a choice, which lies dormant, which can be gently inspired by self-talk. Each poem in this book banks on the hope of emerging stronger, saner, positive and resilient. Each poem in this book would talk to you, revealing layers of enclosed emotions. Each poem would divulge a secret path that could lead you into the world of poise and serenity. While there are no boxes for grief and joy, some persons in our life are more closely associated with these emotions. Their separation shatters us, their memories echo, we grieve but life does not stagnate for anyone…it is more like a river that flows despite the boulders. When imagination and inspiration tries to offer solace, poetry that you are about to read springs forth. A self-published author, she is the poet of Sublime Shadows of Life and Emerging From Shadows, both widely acclaimed poetry books. 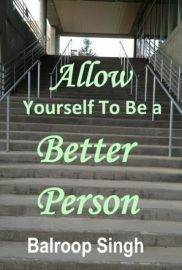 She has also written When Success Eludes, Emotional Truths Of Relationships and Allow Yourself to be a Better Person. 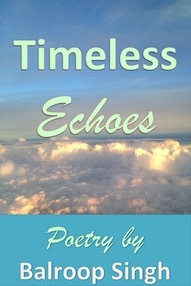 Her latest poetry book Timeless Echoes has just been released. Congrats Balroop! I didn’t realize you had a book of poetry. Do you have any of the poems on this site? Thanks Brad… Two of the poems that I posted this month are excerpts from my debut book ‘Sublime Shadows Of Life’ and I have mentioned that also but it seems you didn’t notice them. In fact I am more comfortable with this genre of writing as we can say a lot through symbols. Thank you for paying attention to this page. You’re welcome Balroop. Yes, I’ve been missing a lot of posts lately. I’m subscribed to many blogs and may need to trim. I’ll hunt for your poems. I too enjoy writing poems more any other forms, maybe because they have more feeling and directness when done well. Thanks Brad, you are right! the feelings can be conveyed better through poetry. ‘The Valley Of Happiness’, one of my favorite poems, was posted this month, probably you didn’t see that. If you just click on the icon above, it will take you to Amazon and by clicking again on the cover, you can read the initial pages, as a sample of my book. Happy Reading!